Hello again! 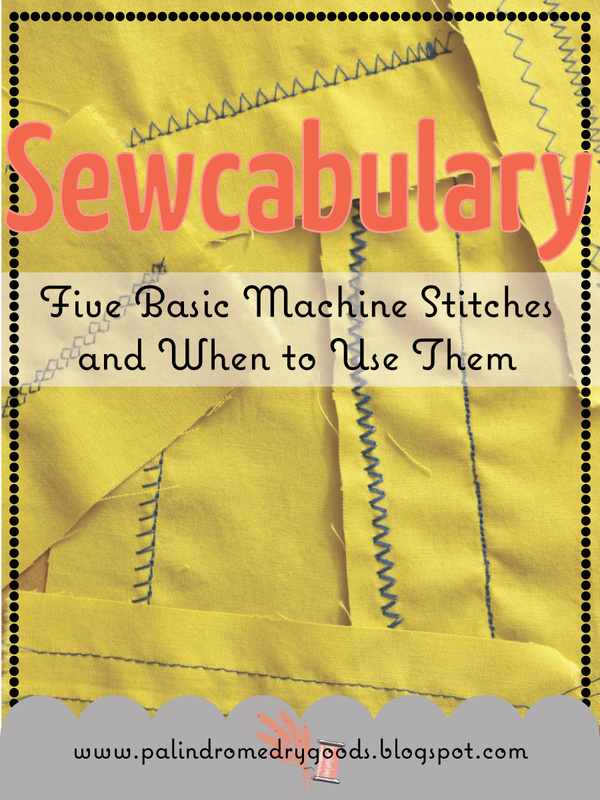 This week during sewcabulary, you'll get a healthy (but not scary!) 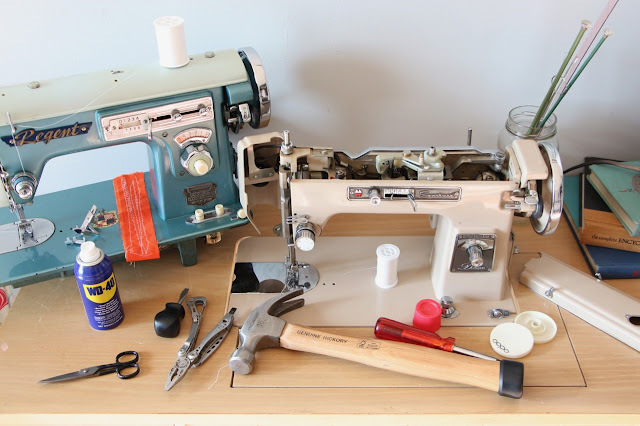 introduction to basic sewing machine stitches. 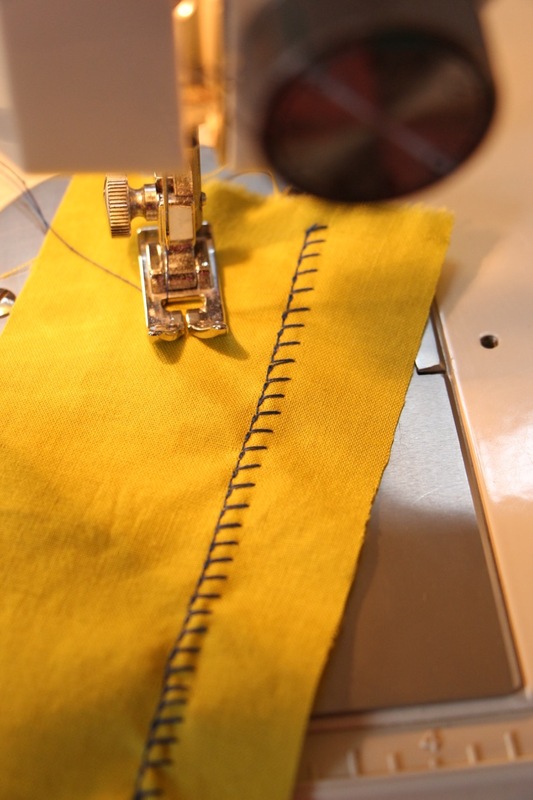 There are hundreds of different stitches out there in the world, and depending on your machine, you may be able to sew using all of those, or only a couple. We're going to cover five stitches that I use often, and that I'm confident beginning sewists need to have knowledge of. If you have the manual for your machine, it will be extremely helpful. As always, if you have questions about the sitches, please comment below! 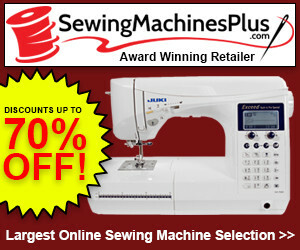 If there is a stitch you use all the time that I don't list, let me know, let's share the sewing love. Here is my sewing machine, a Necchi 3354 for those interested. Those little rectangles with number above them represent different stitches. The knob in the center of the photo below is my "stitch selector". I'll be referencing this picture in the explanations below. You don't need to fully understand these yet, keep reading and you'll understand more! 1. 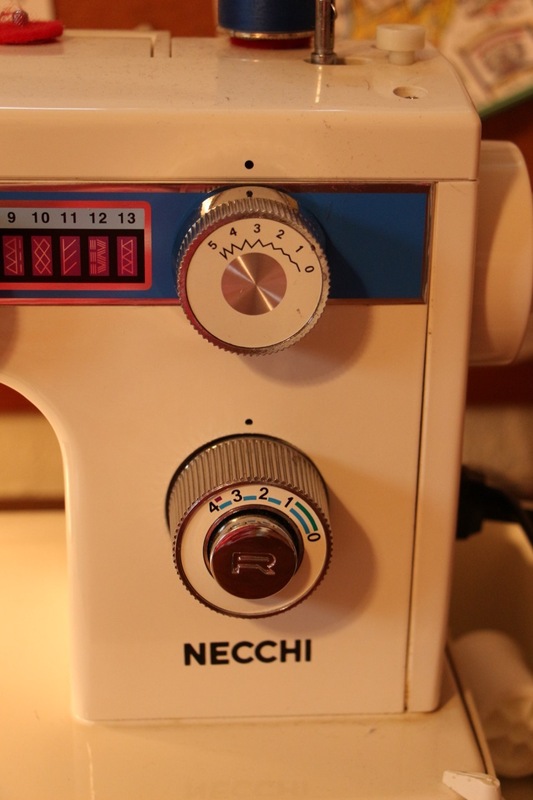 The straight stitch (number 1 on my sewing machine): All hail the straight stitch. This is the absolute bread-and-butter of sewing. 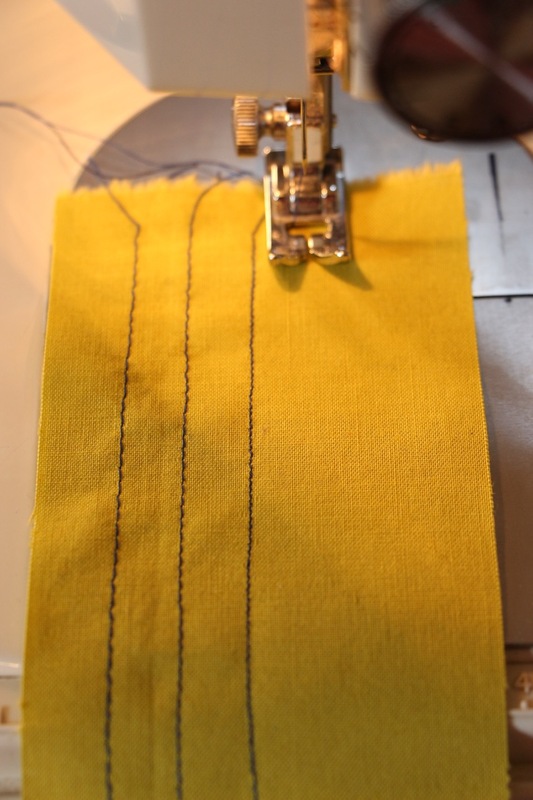 Straight stitches can range in length (this is something you set, using your stitch length knob) and are the stitch you will use for most sewing. Straight stitches do not have width. 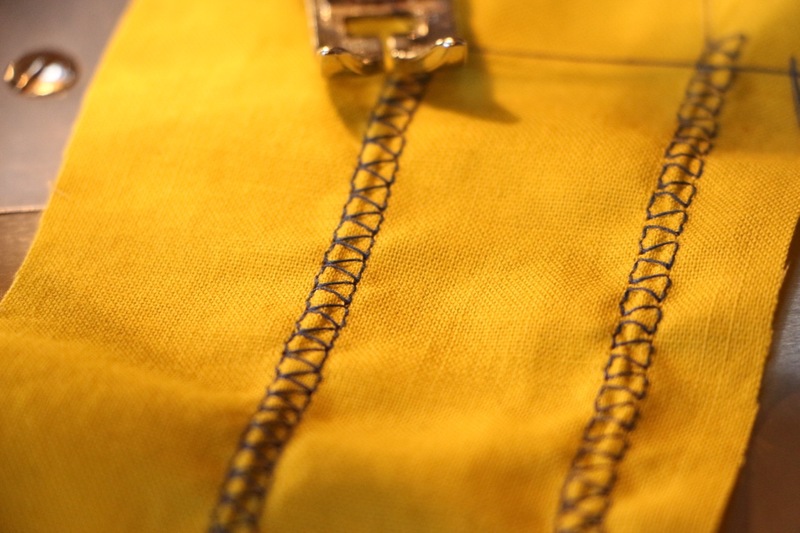 A straight stitch with a lot of length is called a basting stitch, and is used for gathering and to hold pieces together to 'test' them before you sew them together for real. In the picture below, the basting stitch is on the left. 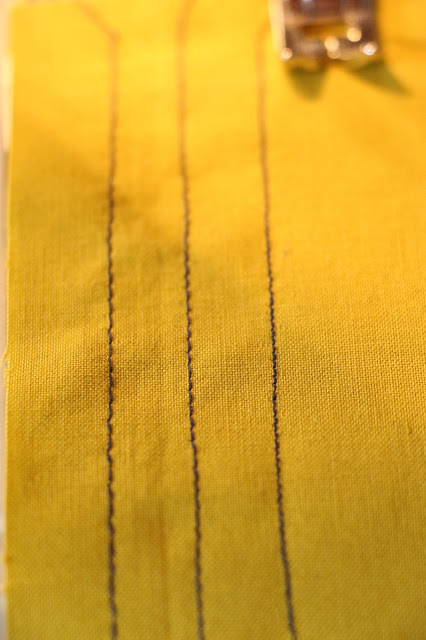 A regular length stitch is in the center, and a fine stitch (which is not very useful) is on the right. 2. 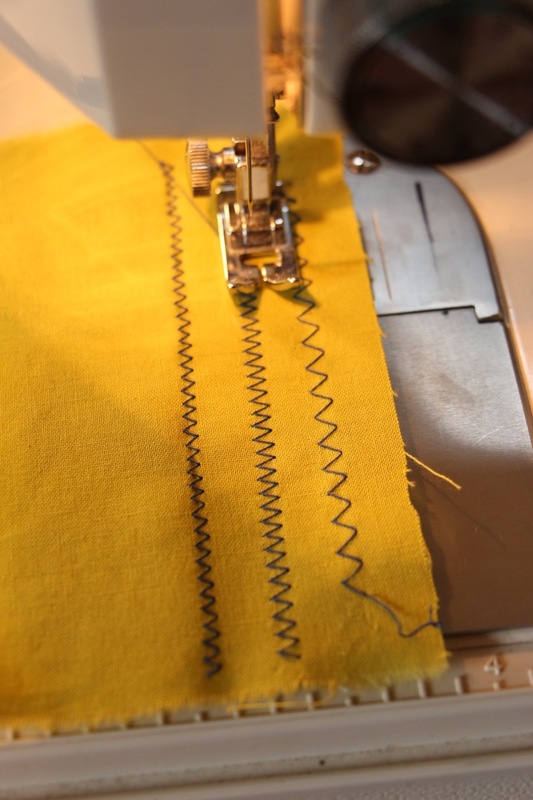 The Zig Zag Stitch (also number 1 on my sewing machine): These stitches, in addition to being cute details, can be used as a rough finishing method to prevent internal seams from fraying. You can create many different looking zig zag stitches by adjusting stitch length and stitch width. These different zig zags are good for mending, applique, creating buttonholes, holding cording in place, and joining two pieces together edge to edge, to name a few. 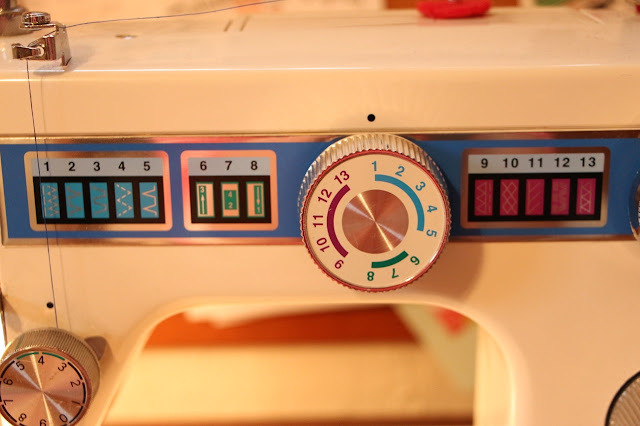 You may be asking "Why are both the straight stitch and zig zag stitch number 1 on your sewing machine?". Great question. Remember how I said that straight stitches don't have width? 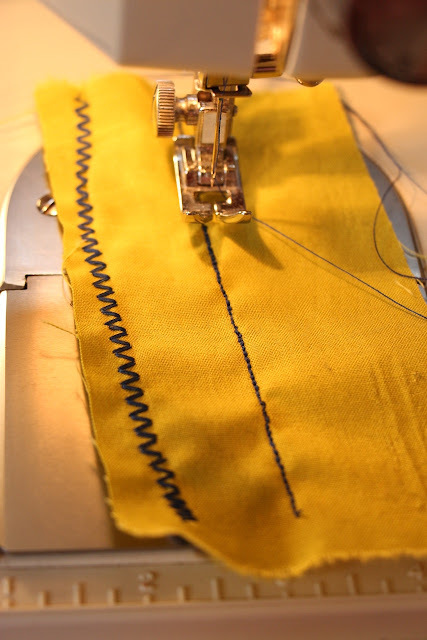 Well a zig zag stitch is a straight stitch that goes from side to side (meaning it has width). In the photos below, I made adjustments to width and length so that you could see three (of the many!) 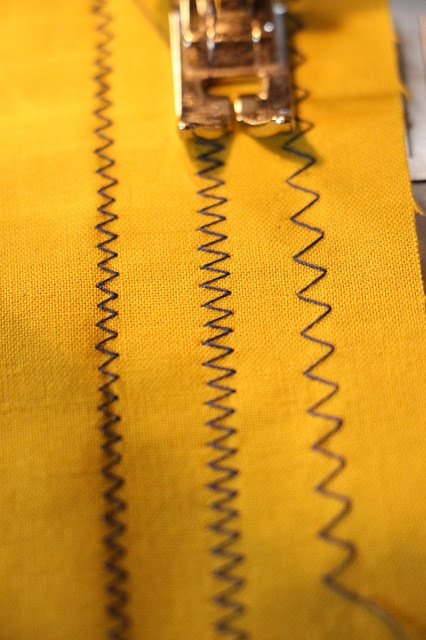 different types of zig zag stitches you can create. 3. Overedge Stitches (numbers 9, 11 & 13 on my sewing machine): These types of stitches are essentially fancy versions of the zig zag stitch. They are most useful as seam finishes, to prevent internal seam allowances from fraying. They can be used on both woven and knit fabrics (non-stretchy and stretchy). 4. Stretch Stitches (number 12 on my sewing machine): These stitches are called triple-stretch-stitches. My sewing machine has an option for a straight stitch or a zig zag stitch. The machine literally goes back and forth over each stitch 3 times (twice in the forward direction, once in the reverse direction). These stitches are best used for seams on stretchy fabrics (jersey, knits, elastic, spandex, etc.) 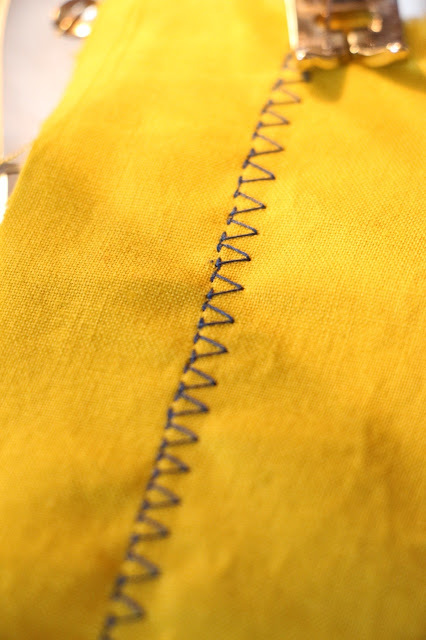 and allow our regular ol' sewing machines to produce stitches that stretch with the fabric. This is crucial so we can get things like t-shirts over our heads without tearing our seams. 5. 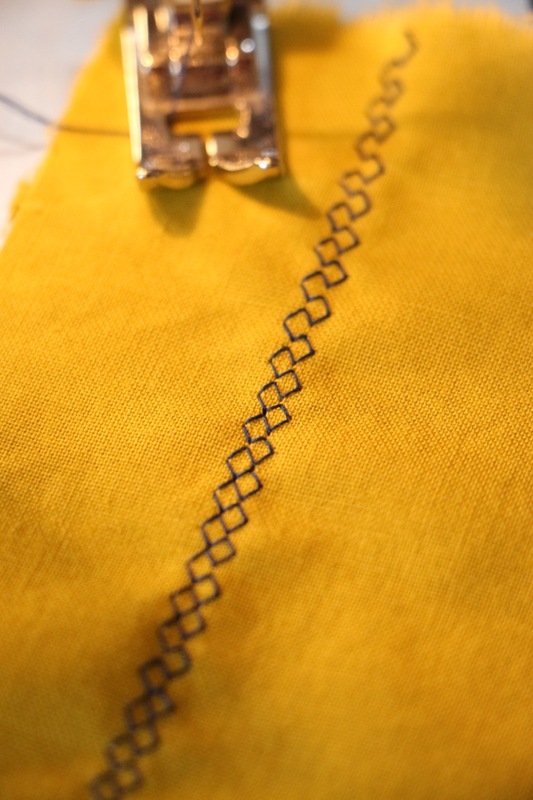 Ornamental Stitches (number 10 on my sewing machine). The stitch pictured below can also be used as a stretch stitch, but I honestly never use it for that, and have found that I use it more just because it looks neat. There are at least 30 kind of decorative, or ornamental, stitches. My sewing machine doesn't have any. 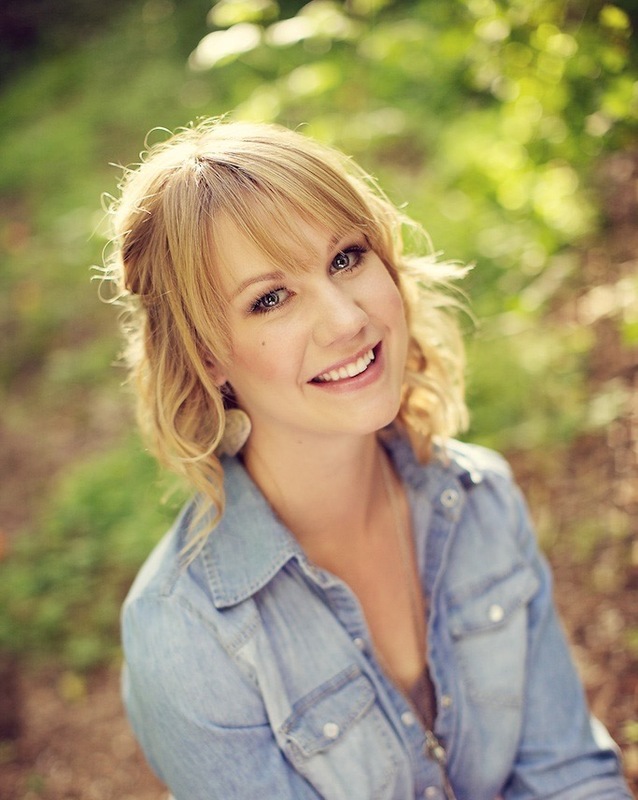 Check out how beautiful they are here. These stitches are great to use as a detail on pretty much anything. Receiving blankets, napkins, aprons, hems, and sleeve finishes are few great pieces to incorporate decorative stitches that I can think of immediately. So there you have some very basic stitches and when to use them. You'll notice that I skipped stitch numbers 2-8 on my sewing machine. That's because 6, 7, and 8 are buttonhole stitches and there will be an entire post devoted to how to make a buttonhole. I never use stitches 2-5 and therefore didn't include them. This is not intended to be an in depth discussion on stitches, or how to set them. Would you like further instruction and illustration on how to set your stitches and how they can look different because of those settings? Let me know what else you'd like to see or if you'd like clarification on anything!